We are a family, providing 360º of wrap-around support to ensure our students reach their full potential in life. The EFAC program offers mentoring, career development training, and community engagement opportunities so that our scholars graduate prepared to succeed personally and professionally throughout their lives. 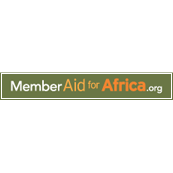 EFAC 360º is a NEW monthly giving platform for donors who are inspired to sustain our whole-child approach to education. 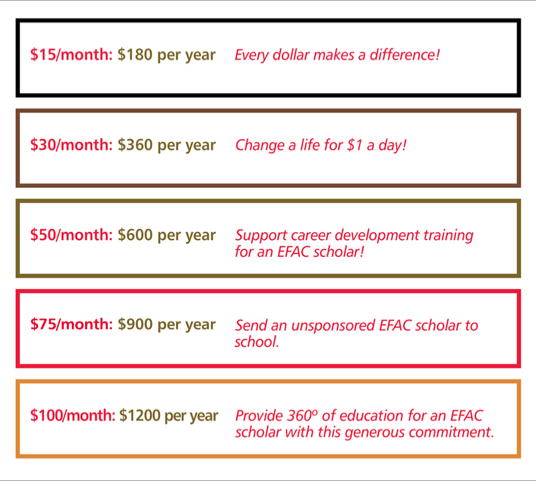 When you join EFAC 360º, your monthly contribution will go directly toward helping an EFAC scholar along her/his path out of poverty. Members of EFAC 360º will receive targeted email updates about our students, spotlighting their achievements and stories of transformation. EFAC will host an annual event honoring your generosity and impact as a sustaining donor. 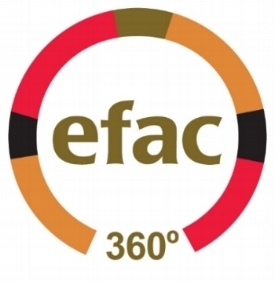 EFAC 360º members will have the option to be recognized in our Annual Report. of our inaugural EFAC 360º members.